The NHL lockout is over but the league is trying to win back the hearts and minds of its fans. The shortened 48-game season starts this Saturday and if you want to catch all the action live from your iPhone, iPad, Apple TV, Mac, Android, PC, Boxee, PS3, Roku XBOX 360 and Sony device as NHL Game Center Live has been ‘discounted’ to only $49.99 for 2013. Compared to last year, NHL Game Center Live cost around $175 for the entire season. It allows you to watch live streaming of every game from any device, along with replays and more. So from that standpoint, this is a somewhat lukewarm ‘deal’ as it’ll be just over $1 per game to watch live NHL hockey from any iOS device or Apple TV. There are caveats though. Streaming of games, while available in HD-like quality depends on your bandwidth. Also, there are local blackouts, so for example if the Canucks game is on TV, you won’t be able to watch it in Vancouver via Game Center Live. However, many online have noted those with paid VPN services can bypass local blackouts. Also, Game Center will auto-renew so if you’re not going to subscribe for next year, you’ll need to call in to manually cancel after this season. 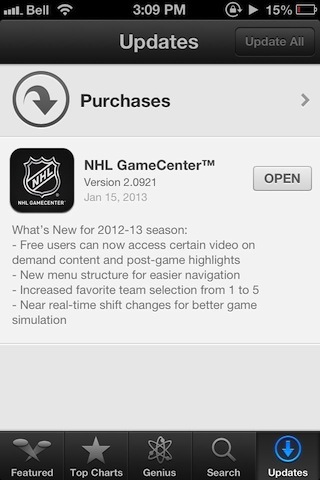 The updated NHL Game Center Live app should hit the App Store today. Anyone going to sign up for this?